More than 1 senior marketer in 3 indicates that their company has either not engaged in or has only just started the integration of social media in their company. 47% are in an experiment stage and 14% indicate that social media is fully integrated in the company. In spite of the low social media integration there is a high social network sites adoption. 68% of the companies have a Facebook page, 56% a Twitter account and 47% a LinkedIn page. "These results show that many companies have started social media in a tactic way. They rapidly created an account on a popular network, without it being part of a total strategy." says Professor Steven Van Belleghem of the research agency InSites Consulting. Companies which are active in technology, telecom and media are way ahead of the others where social media integration is concerned. 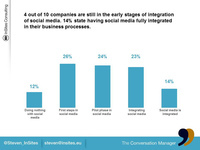 A quarter of these companies indicate having integrated social media in their company processes. On the other end of the scale there are the financial and pharmaceutical sectors. One out of 3 of these companies are only just starting their social media adventures. "The financial and pharmaceutical companies are part of difficult sectors where usage of social media is concerned. The legal and privacy-related matters are more important in their sectors than in the others. 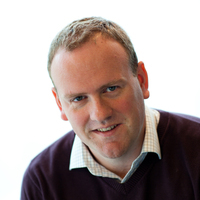 ", says Van Belleghem from InSites Consulting. Companies having invested little up till today in the social media integration mainly see the uncertainty concerning the financial return. This is the main inhibition so far, followed by a low fit with the product portfolio and a lack of support by the top management. Nonetheless this survey shows a positive correlation between the extent of social media integration and the company’s financial results. 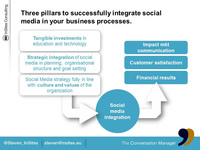 The more a company integrates social media in its commercial processes, the stronger its financial results. Furthermore there is also an increase in impact of other types of marketing communication, and there companies have more successful product launches than companies which do not integrate social media.